If you’ve never heard of a Wet Brush ($13.95) before, then we’re about to blow your mind. Not only are they the trendiest new hair accessories that you need, but they’re perfect for girls who have a few too many knots and tangles in their hair. Each brush actually skips the plastic bristles in favour of unique IntelliFlex which helps to untangle knots with minimal damage or irritation. You won’t find yourself constantly tugging at your ends to remove those stubborn knots, and the bristles aren’t likely to fall out or break. The bristles are longer and equipped with a tiny bead on the end for maximum scalp penetration. Simply apply in circular motions around your scalp to boost circulation, and penetrate the hair follicle. As opposed to other popular brushes on the market, the Wet Brush is relatively pain-free especially on those tough tangles. Long-haired girls can definitely feel my pain on this one. Instead of causing breakage, the bristles carefully remove any knots without tearing the hair and leading to nasty split ends. Since the bristles are so soft and thin, they are perfect for women who regularly wear hair extensions or wigs. They don’t damage your real or synthetic hair, and absolutely will not create additional breakage with extended use. Brushing thick hair can be a task in itself, especially when you’ve come out of the shower. 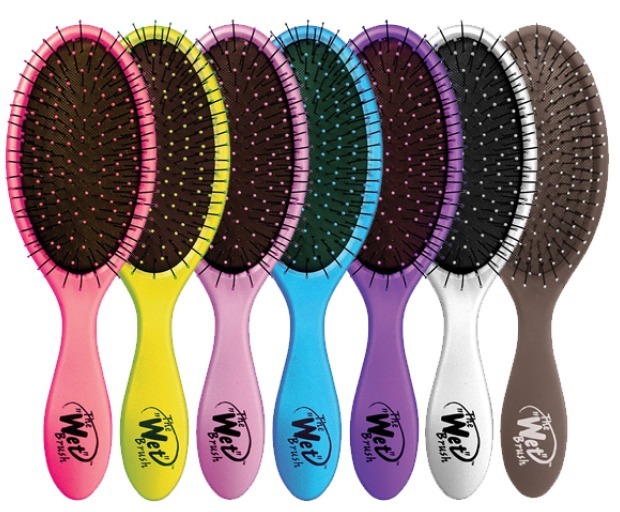 The Wet Brush was specifically designed for damp and thicker hair types, and is available in number of paddle brushes and colours to suit your lifestyle. Are you convinced yet? We’ve already replaced all of our other brushes and combs with this amazing hair tool! Colour-treated hair might look amazing, but sometimes all the extra maintenance can feel a little daunting. Rather than protecting your hair from all the elements, we have compiled your go-to list of tips for treating your hair, and making the colour last that much longer. Once your hair is damp from the shower, use a few drops of hair oil and work this into your ends. Rather than lathering up your locks from root to tip, keep it confined to your problem areas which could include split ends. Oils are essential because they help to mend the hair follicle, and make your hair look thick and shiny. Using too many heat products on your hair will only make it dry and brittle – this is common sense! Why not take advantage of the warmer weather and let your hair air-dry naturally, rather then using a blow-dryer, straightening irons, and curling wands all in one go. Give your hair a rest at least one day a week, the extra frizz is worth it! Especially if your hair is bleached blonde, booking in those trims every 6-8 weeks is essential for smooth, silky hair. Although it might seem like the cheaper alternative, making a drastic change from blonde to black (or the reverse) will only damage your hair. Not to mention the huge risk of your hair turning orange in the process! If you do plan to colour your hair for the first time, use a permanent shade which will eventually fade back to your natural colour. Move over Tange Teezer, the Wet Brush is the new hair tool you must use! It helps to de-frizz and untangle your hair in one simple motion. The super-thin bristles won’t cause your hair to split and break (unlike other brushes), and is safe enough to use almost every single day. Since your hair is coloured, it’s important to use specialised shampoo to prolong your colour. There are a number of products available to brunettes, blondes and even redheads to help seal the colour, and make it look shiny for longer! Sulphates are small chemicals found in a number of mainstream shampoo’s, and they have the ability to strip the colour out of your hair. Use specialised formulas which are packed with essential vitamins and nutrients to keep your colour from fading. Hot water dries out the hair, and could leave your colour looking dull and lifeless. Rinse your hair with cold water since it locks in shine, and keeps your scalp from drying up. Try your own hair mask packed with eggs, honey, apple cider vinegar, and olive oil to bring back the shine to your hair. This is beneficial for all hair types and textures, and won’t weigh it down. Apply from root to tip, and wash-off with shampoo after 1 hour. While sometimes it might be tempting to go back to the salon and add a few more highlights, this ultimately isn’t healthy for your hair. Allow it to breathe for at least 3 months before adding any additional peroxide to your ends.